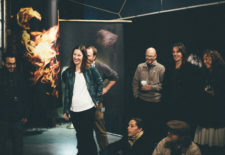 For more than four decades, Maine Media Workshops has enjoyed an unparalleled reputation as one of the most inspiring places in the world to learn the art and craft of visual storytelling. Maine Media students represent 44 countries and our alumni have gone on to establish significant careers in the media arts. 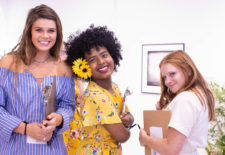 Maine Media students and alumni range in age from 14 in our Young Artist program, to artists in the prime of their careers, and those in their 70’s, 80’s and 90’s who continue to find inspiration here each year. 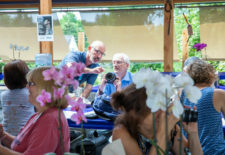 Founded in 1973 as Maine Photographic Workshops by David H. Lyman, the school soon grew to offer film, television and AA degree programs as Rockport College. In 1995 we began offering our MFA program, and in 2007, we changed ownership and were incorporated as a non-profit 501(c)3 known as Maine Media Workshops. Today the institution is governed by a nonprofit Board of Directors and has thriving programs in all forms of photography – traditional darkroom, historic processes, and the latest in digital technologies – for students from beginner to master level classes. Our filmmaking programs include cinematography, writing, directing, editing and more in narrative and documentary forms. In 2013 the school built a book arts studio and offers courses in handmade books using letterpress printing. Today, we offer a variety of writing workshops in poetry, non-fiction, and more. The various forms of storytelling – visual, auditory and written – often complement each other, and students are working across genre boundaries to be creative and innovative in their art. Our programs include one-week workshops, four and six-week courses of study, 8, 10, or 12 week “intensives” that combine workshops and mentorship, 30-week long certificate programs, and our capstone MFA degree for those who are ready to delve deeply into a three-year conversation about their art. Whatever your interest in the media arts, you’re likely to find the right program for you. We are thrilled that amongst our alumni and faculty are Oscar nominees and winners, award winning photojournalists, collected fine art photographers, noted authors, screenwriters and poets. Fun fact, Woody Allen’s editor, Ralph Rosenblum, loved teaching here so much that he asked that his ashes be buried on campus.